Lettuce from the garden, planted during a cool, gray day in March, winter's last gasp. Lettuce seeds are tiny, tiny enough that in March I doubt they will grow. Every year I doubt, and every year they grow anyway. Clams from a back bay mudflat, exposed by the ebbing tide of a full Flower Moon. My fingers found them in the mud, as though my hands evolved just to caress them. Basil plucked from seedlings that spent most of their first few weeks under humming fluorescent lights in the basement. I should have waited a week or two, but I did not. Blueberry mead from berries harvested last June, mixed with honey sent by Dave in Michigan, bottled a few weeks ago. The exhausted yeast sit like primordial ooze on the bottom of each bottle, waiting to wake up again. Eating truly fresh food drags us back into the life cycle. When I harvest clams, I rake up a bit of mud. A clam rake is heavy and sharp. I accidentally impaled horseshoe crabs and moon snails when I was less experienced. When I am raking, I become intensely aware of life. As I paddle back home, some mud on the tines of my rake start to dry out, and I think about the thousands of organisms now dying, trapped in a tiny blob of mud. Yesterday I made a mistake I will not make again. 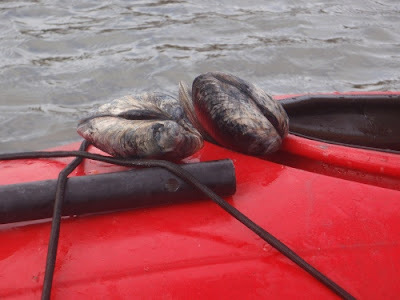 As I was cleaning the mud off my clams, I tossed them one by one into a pile on the edge of the Delaware Bay. One landed on the pile, and I heard it crack. A flake of shell fell away like a chipped tooth; the clam protruded part of its flesh as though inspecting the damage, then withdrew. It lived long enough to be eaten. We had a few extras, so this morning I tossed them back, but not before slaughtering four more. I went striped bass fishing this morning with my remaining clams and my clam knife. I had a club with me. If I had caught a legal bass (they must be at least 28"), I would have struck it unconscious, then lifted its gill cover to cut its gill arch. The fish, unconscious but not dead, its heart still beating, would then have bled to death, scarlet blood mixing with the ocean, feeding plankton I cannot see. I do not enjoy slaughtering, but I do not hide from it, either. It is easier to toss a fish in a bucket of sea water, and let it stew in its own carbon dioxide. It may even be less barbaric. It is not, however, less cruel. A big chunk of teaching biology is showing how life works. Not pretending. Not hiding. Not rationalizing. On a good day, not even explaining. Robert Frost does this. So does Galway Kinnell. Good Morning - I am still a few days away from my first garden salad, but not too many... Awareness is so critical of what we eat. Where it comes from, how it lived, how it made to our plates. Even the greens in the garden. I love this time of year. My yard is gorgeous - lilacs, apple blossoms, peach, tulips, the red bud tree - and the garden has so much potential. Will the seeds germinate? We can only hope and give it our best effort. I'll take that to school today, too.